The creative and freedom-loving nature of Bonnard resisted any restrictions, no matter what spheres of life, and even more so of art, this did not concern. His creative search is not interrupted until his death, he is constantly looking for solutions that can overcome the canons, regulated by easel painting. One of the main goals that the artist sets himself, devoting his life to creativity – overcoming the boundaries that separate the different directions of art: theater, poetry, music. To unite art and life is the motto under which Bonnard worked tirelessly. 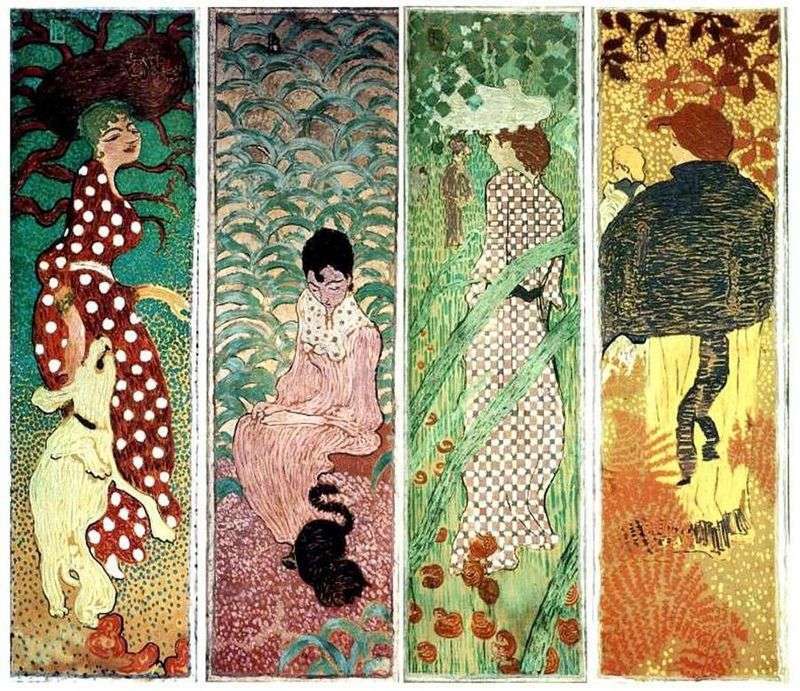 At the age of twenty-four, the artist “nabist” created the cycle “Women in the Garden,” consisting of four panels, which he thought of as a decoration of the screen. Bonnard planned to exhibit them in 1891 in the Salon of Independent, but they were exhibited separately at the exhibition, and were presented under the name “Decorative Panel”. The artist explained his decision by the fact that in his vision, the works were more pictures than screens. The manner of execution of paintings, as well as their themes – a tribute to Japanese art, to which Bonnard gravitated. The flat silhouettes of the characters are depicted on a flat background. There are no chiaroscuro and depth, there is no question of semitones. All elements of painting are decorative, which is also characteristic of the art of the Far East. It is with the paintings of this series that decorative works begin in the work of Bonnard. Description and meaning of the painting Women in the Garden by Pierre Bonnard.